The Election Meetings of the Conservators will take place in Royston Hall satrting at 7pm on 12th Febuary 2019. This is the legal notice of those meetings. The Chairman will make a report on the last tweleve months activities of the Conservators and answer questions. Thursday 11th October 2018 saw the Conservators of Therfield Heath & Greens hold their second public meeting in the Town Hall of Royston to an audience of over 60 people from both Royston & Therfield. The meeting was chaired by newly elected vice Chairman Colin Smith and after a warm welcome and a few apologies the first hour was listening to the Tenants of the Heath present their stories which included an insight into the Ecology of the Heath, Natural England Stewardship & the importance of Grazing delivered by Cynthia Coombe. Amelia Whitaker updated and encouraged people to join the Friends of the Heath, followed by reports on the History of Royston Golf Club by Chairman Keith Pitts, the huge success in Rugby from President Godfrey Everett, and the need for improved changing facilities to cater for the increased number of children and ladies playing Rugby. David May from Cricket gave an insight to the future development plans of Cricket in both Therfield known as TRAKSA and the potential to return to the Heath. Other reports were delivered in absence by the Conservators including: Heath Sports Club, The Police, Archery & Tennis Clubs. The meeting was closed with a statement from Colin Smith on how busy the Heath had become and the challenges that lay ahead with opportunities and risks linked to the town’s expansion from housing, not least with a continued approach from Gladman. He expanded on how the role of the Conservators had changed and the pressures on them from all areas due to increased awareness through social media. The big surprise was that when suggesting that car parking charges should be made with the introduction of security cameras no one seemed concerned as everywhere else was charging for parking and this money could contribute to the maintenance of the Heath car parks. As we move into the winter months, we expect to see and hear good numbers of assorted Thrushes using Therfield Heath. Flocks of Redwings and Fieldfares (often mixed) will start appearing and be heard calling from the marginal trees and be seen feeding on the open grassland. These migrants come in search of things like worms and insects on the ground as well as berries and fruit in bushes and trees. On the ground, the Fieldfares are visibly larger than the Redwings and have obviously grey heads. In flight, Fieldfares have a pale grey rump and the Redwings have red patches under their wings. Fieldfares in particular have very distinctive ‘chak-chak’ type calls. Another thrush that will usually be seen in small flocks feeding in the open grassland areas is the Mistle Thrush. They are larger than the others and paler in colour. They have a rattling call in flight. With November comes Bonfire Night and we respectfully ask that no fires are lit nor fireworks let loose on Therfield Heath as it is against the Bye Laws. The Long Barrow is situated on the edge of the 17th fairway near the chair on top of the hill as you walk away from the Heath Sports Club. Here In mid-November, there is due to be an archaeological survey of the long barrow by a team from the University of Leicester, using a variety of geophysical techniques. As soon as we know what they find, we will let you know. Long barrows were used by Neolithic farming communities for burials. The barrow on Therfield Heath has been damaged by two previous partial excavations – in 1855 and 1935. Modern techniques are rather less intrusive and will not damage the structure. The long barrow is protected by the Ancient Monuments and Archaeological Areas Act (1979), as are the later round barrow burial mounds seen on Therfield Heath. We enter the autumn months after one of the hottest summers ever recorded and you will see how quickly the Heath recovers. With autumn comes cold and rain and the likelihood that some paths will become wet, muddy and slippery – especially on steeper slopes. Please try and avoid too much damage and erosion to the site by making use of alternative routes – there are many to choose from. Do the sheep graze or do we cut as highlighted last month? We await news and decisions regarding the return of the sheep and the timing and locations of cutting. We will keep you up-to-date via The Listing, the map on the Heath Sports Club our website and social media. We put up signs to warn site-users of wasps’ nests so the areas could be avoided. A dying wasp releases an alarm pheromone which smells. The odour alerts the other wasps and within 15 seconds other wasps come to the aid of the dying one, so it is best just to walk another way. By now these nests are likely to be inactive as most wasps do not live throught the winter. We will have started our winter programme of conservation work with the volunteers on September 16th. This is the time of year to work on cutting back the scrub and saplings that encroach on the open grassland because the disturbance to wildlife is minimal. The next open meeting will be held in the Town Hall on October 11th @ 7pm where we can tell you more about our future plans, please do come along. The Kite Festival was a huge success in searing heat, yet the Heath was very busy with a reported 6k people coming to see the annual spectacular. The Friends of The Heath also attended the Festival and got some great feedback and recruited volunteers, they will be reporting elsewhere in the Listing. Well done Rotary for again organising such a great event and for the huge team effort to clear up so quickly, Thank you to all who helped. At last a few showers, is there such a thing as the correct rain? Well yes the gentle downpours in mid August were beneficial. This has helped the grasses to recover slowly and remove any potential fire hazard. The natural life-cycle of grasses sees the stems die and go brown as their seed ripens. The dry weather adds a stress which can hurry this process up. It is, however, completely natural for the Heath to go brown, just not necessarily so early in the season. There could be a knock-on effect in availability of seed food for birds later in the season: seeds may be smaller and may drop sooner. The sheep are still being kept off the Heath south of Penn Hill at the time of going to press. We will keep you up-to-date with their whereabouts via The Listing, the map on the Heath Sports Club our website and social media. It’s been a fabulous year for butterflies so far on the Heath – with good showings of Chalkhill Blues, Dark Green Fritillaries, Marbled Whites and many more. A few dedicated volunteers conduct regular butterfly surveys on the Heath and we await their results with interest. A volunteer group conducted Ragwort pulling over the summer, as agreed with Natural England. We did not aim to eradicate it because it is not without its ecological benefits and we didn’t remove those that were already being eaten by caterpillars. Please remember, it is an offence for anyone to pick or uproot any plant on Therfield Heath unless prior agreement is obtained from Natural England. September should see a cut and collect on Lankester Hill as the second best option to grazing, as discussed with Natural England. You may not be aware quite how much it costs us to dispose of your rubbish – around £7500 a year. It seems a real shame that people cannot simply take their litter home – it is, after all, the responsibility of those generating the litter. Sadly, it means £7500 that can’t be spent on site maintenance. Therfield Heath is a nationally important nature reserve. It supports and incredible diversity of rare flowers and insects. In early June, we found a shieldbug that has not been recorded in Hertfordshire before. In July, the Chalkhill Blue butterfly will be on the wing – a butterfly that is dependent not only on its larval foodplant (Horseshoe Vetch) but also on ants to look after it during its underground chrysalis phase. This the second update from The Conservators of Therfield Heath & Greens and with improving weather comes increased usage by all which has meant that the introduction of signs has been made to help. You will have seen four new signs have been placed to protect the ground nesting birds on Lankester Hill. 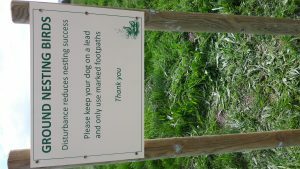 Meadow Pipits and Skylarks are in abundance until July so we ask that to stop dogs quartering either take a wide berth or have them on a lead in this area. It is a sad fact that some people cannot respect nature and we have had instances where the rare Pasqueflower has been dug up by collectors and this is illegal and liable to prosecution, if you know who it is please notify the Police. Jubilee Wood now has an abundance of flowers and we ask that you stick to the paths whilst walking through. The sheep will return to the heath in June. We will keep you up-to-date with their whereabouts via The Listing, the map on the Heath Sports Club our website and social media. The latest update from The Conservators of Therfield Heath & Greens finds us in the height of summer having had most of June and July without rainwater. This has had a major effect on the grasses which like everyone’s garden has turned brown and the ground under foot is very hard and is a potential fire hazard. The lighting of fires is a criminal offence and is liable for prosecution and common sense would suggest that any naked flame is dangerous on such dry ground and we prefer not to have even more signs out to spoil the view. It’s been a fabulous year for butterflies so far on the Heath – with good showings of Chalkhill Blues, Dark Green Fritillaries, Marbled Whites and many more. We have seen many Lizards but none as big as the nesting Monitor Lizards found in the woods which caused the RSPCA to be called out. A big thank you goes to the keen eyes of the dog walkers who are our eyes and ears. With the summer holidays well under way people using the Heath for picnics need to be considerate of where they are and please make sure you take your rubbish home with you. It costs the Conservators 7.5k PA to remove rubbish and dog bins. The signs placed to protect the ground nesting birds on Lankester Hill have now been removed. Both the Meadow Pipits and Skylarks had a successful breading season and we thank everybody for their consideration. Meanwhile the hot weather delayed the introduction of the Sheep until July and they have not been very happy up on Penn Hill (map included) In fact the owner has had four occasions where the sheep have been disturbed and broken from their enclosure and meant that they were removed for their safety until further notice. We will keep you up-to-date with their whereabouts via The Listing, the map on the Heath Sports Club our website and social media. Our next volunteer task will be ragwort pulling, as agreed with Natural England. Ragwort is deemed harmful and we have a duty to keep it under control and not to allow it to spread. We will not aim to eradicate it because it is not without its ecological benefits and we won’t remove those that are already being eaten by caterpillars. Please remember, it is an offence for anyone to pick or uproot any plant on Therfield Heath unless prior agreement is obtained from Natural England. Finally, The Friends of Therfield Heath & Greens championed by Rod Kennedy have met and appointed a committee. They will be launching at the Kite Festival on August 5th and will be looking to recruit volunteers who are passionate about the future of Therfield Heath, so please come along and say hello to the team.